Scrape the seeds from the vanilla pod, cut the butter into small cubes and place in a bowl. Add the flour and the sugar and rub together with the tips of your fingers until the mixture resembles breadcrumbs. Add the egg yolk and bring the mix together until it forms a ball. Knead with the palm of your hand until smooth, wrap in cling film and rest in the fridge for at least 30 minutes. Roll the pastry out between 2 sheets of baking paper to 5mm thick. Grease the inside of the tart cases with soft butter and dust with plain flour. Transfer the pastry to the tart case and trim the edges. Line the inside of the tart with baking parchment and cover with baking beans. Transfer to the oven and blind bake for 20 minutes until golden brown. Once cooked, check the pastry case for any small cracks and fill with any left over pastry if necessary. Brush the pastry with a little beaten egg and return to the oven for 10 minutes. Zest and juice the lemons. Cut the butter into small cubes and allow to come to room temperature. Place the juice and zest into a wide bottomed pan with the whole eggs, egg yolks and sugar. Whisk over a very low heat until the sugar has dissolved. Add half of the butter cubes and continue whisking. As the eggs begin to cook the mixture will thicken. Cook and whisk until the mixture coats the back of a spoon. Once you reach this stage, whisk in the remaining butter one piece at a time and then pour the mixture through a sieve into a cold bowl. Whisk until it is lukewarm. Spoon the mixture into the tart cases and then refrigerate for 10-15 minutes or until the mixture is set. 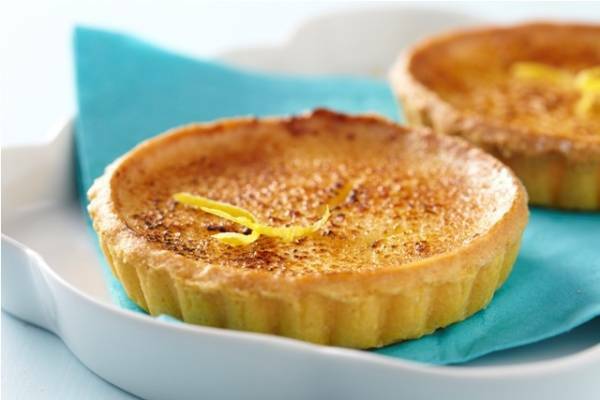 Dust the tart with icing sugar once it is set and caramelise with a blow torch or under a very hot grill.